Robert Hight entered the 2018 NHRA season as the reigning champion in the Funny Car division, presumably with the hopes of backing up the title was a strong start to the new season. Unfortunately, while things have gone well for John Force Racing as a team, 2018 hasn’t been so kind to Hight. Before coming into Joliet, Hight had made it to the finals three times and he lost all three while teammate Courtney Force has gone to the finals five times and won three – only losing those final rounds at 4-wide events. 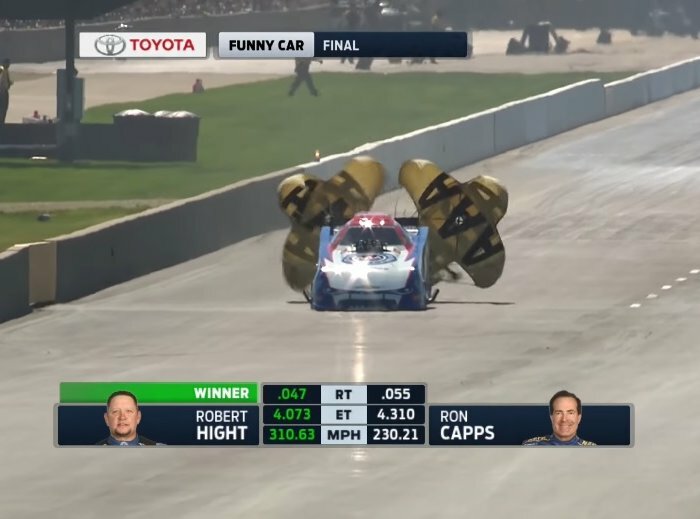 However, Robert Hight would get some revenge on his teammate while also pulling down win #1 on the 2018 season when the funny cars took to the track in Joliet, Illinois. While Courtney Force and John Force put their Camaro funny cars in the top two positions in the first round of qualifying, Robert Hight found himself in 16th out of 17 cars. In the second round, Courtney fell to fourth and John dropped to sixth while Hight climbed up to 10th, but he fell to 11th after the third round and was forced to settle for a 12th starting position on the ladder while Courtney Force started in the fourth spot and John Force was in sixth. In other words, qualifying didn’t go all that well for the John Force Racing Camaro funny cars, as they watched their Dodge Charger-driving rivals from Don Schumacher Racing take each of the top three spots on the ladder. Fortunately, as the old adage goes – it’s not where you start, it’s where you finish. In the first round of eliminations, Robert Hight and his Camaro beat Cruz Pedregon and his Toyota, getting a bit of revenge for the final round loss Hight took earlier this year against Cruz. In that same first round, John Force beat Tim Wilkerson and Courtney Force beat Jim Campbell, so all three John Force Racing cars made it through to the second round. However, three of the four Don Schumacher Mopars made it through as well, setting up some rival battles in later rounds. In the second round, John Force and his Camaro beat Jack Beckman in his Charger to advance to the semifinals while Robert Hight and Courtney Force went head-to-head in a battle of JFR Camaros. Hight pulled the better reaction time, allowing him to take the win, even though Force was quicker to the finish line. Surprisingly, Bob Tasca III beat top qualifying Matt Hagan to advance to the semis, where he would meet Hight, but Tasca’s excellent day came to an end when traction problems have the Camaro the win. On the other side of the ladder, John Force’s day also came to an end as he was narrowly beaten in a great drag race with Ron Capps. This set up a final round between the JFR Camaro of Robert Hight and the DSR Charger of Ron Capps. Both of these drivers have won championships in the past few years, yet both came into this final round looking to get win #1 on the season. Hight got off to a better start and he held a narrow early lead until Capps ran into problems towards the end of the run, giving the Camaro the big win. You can watch that run in the video below. That was Hight’s first win of the 2018 season but for John Force Racing and the Chevrolet Camaro funny car program, this is the fourth win of the year. With his first win of the season, Robert Hight sits in the third spot in the championship race, 104 points behind leader and teammate Courtney Force. Jack Beckman is in second, 81 points back of the leader and Matt Hagan is fourth, 127 out of the top spot after 9 of the 24 events.